In all, I’ve probably spent around eight hours playing Metro Exodus (now officially gold) during a recent press event. There, I’ve played three entirely different levels, the winter, snow-covered Volga, the scorching desert landscape of the Caspian and the almost Far Cry-esque forest of the Taiga. Each new environment required new strategies to survive and progress. Moment to moment, Metro Exodus is a delightfully tense if high stressed affair. Your steps have to be considered, the worth of every engagement weighed up as you are always looking for the safest possible route. The game is designed to encourage cautious play, checking your corners, listening out for any nearby snakes, progressing slowly to ensure you don’t run head first into your death. It’s something the developers are acutely aware of and ready to exploit. Take cover by a building’s remains, pull out your binoculars to scope out a parked car half a mile up the road that looks like the perfect spot for an ambush. Just as you’re confident it’s all clear the wall you’re hiding beside bursts into action revealing a perfectly camouflaged ghoul that can easily kill you in your frazzled panic to equip a close ranged weapon. The game’s world is ready to throw you a curve ball at a moment’s notice, sudden sandstorms killing your visibility when you’re surrounded on all sides. You’re hyper-aware of the few bullets you have left, doubly more so for your trusted shotgun. Your equipment is not entirely reliable, the weapon sights are only so accurate. You’ll learn to take that extra moment or two to line up a target before pulling the trigger. Metro Exodus is a very deliberate shooter. Every headshot you miss, any enemy that takes more than a single shot to take down feels like a monumental waste. Your dwindling resources are a constant thought, informing your every action. Do you use your few available materials to craft an extra health pack? A gas mask filter? Or do you create a couple of incendiary bullets and molotovs to help deal with clustered enemy groups? Exploring a dark underground archive filled with spiders and spider-like creatures that can only be kept at bay via light was a horrifying experience. You’ll madly swing your torch left to right as you back up to a wall, the light being their only weakness, trying to cover your six as they climb walls and clamber through holes attempting to flank them. Metro Exodus is a horrible pleasure to play. It’s incredibly beautiful, one particular shot at night with the moon’s light beaming through the trees actually had me stop for a moment. I then got my back slashed open by a mutant bear. I suppose I should have used the photo mode. My only concern is If Metro Exodus can keep the player fully immersed for its whole run time. There’s a clear formula to its design and how you are introduced to a new open level. I just hope there’s enough variety to prevent any moments feeling too similar. 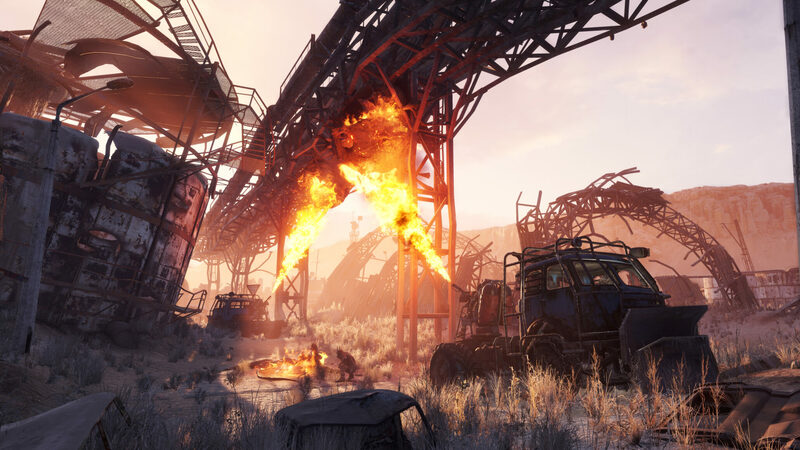 We won’t have to wait too long to know either way, since Metro Exodus lands February 15th on PC, PlayStation 4 and Xbox One.